After the party… what is left. We had the final two shows of Spelling Bee today, which made for a very long day. I actually feel like I lived many days in this single one, and I almost can’t remember the beginning of it. We had a matinee in the afternoon, then about an hour off for dinner, and another show in the evening. Then, the “get out” — the breaking down of the set and the lights and the band, packing it all up into taxis, cars, and vans. Clearing out any proof that we were here at all. We hosted an after-pub party so people could still gather once the regular places threw us out. Everyone just left about ten minutes ago. We did a bit of throwing things into the sink, and now we’re in bed ready to meet sleep. 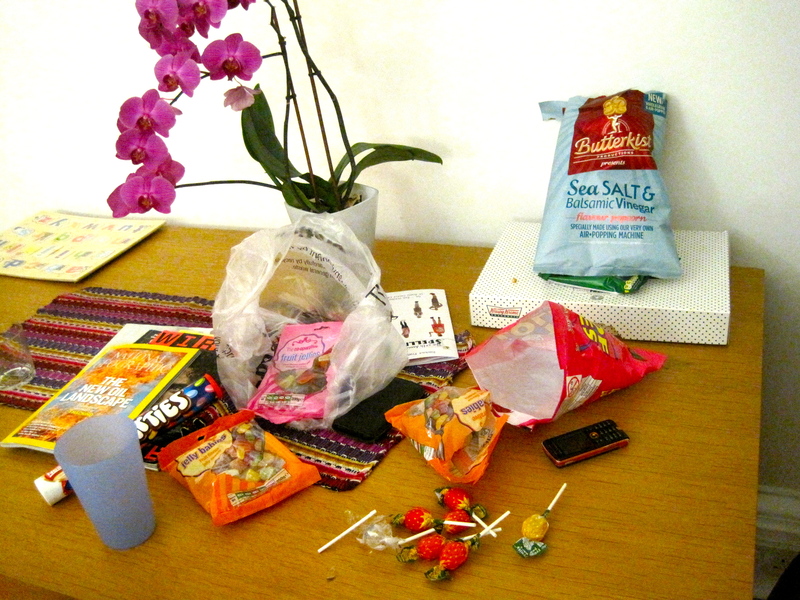 What is left from the party — laughs, lots of crisps, some beer, a lot of candy. During the party, I noted how much I love leaving parties. Not leaving the house, but leaving the hub of the conversation and socializing, walking away to the outskirts and finding people there. Those are usually kitchen conversations, or hallway discussions. But I always love those moments of individual connection in such a public experience, those moments of privateness and intimacy in a crowd. Also tonight, I was thinking about the difference of giving advice and advising someone. I think too much advice-giving is assisted with statements that tell people what to do. I know that people want input, and I know that it can be easier to have someone else make your choices. But I like to think that the best type of advising is really co-questioning. A willingness to hold the space, to take the journey, to explore the steps of a person’s problem with them, by asking them to lead you through it. It’s why the joke on psychologists is true: And how does that make you feel? Questions are a navigational tool, and if you’re not getting the right answers, it only means that you’re not asking the right questions. I wasn’t going to include a poem today, but I got this one in the email (as I think you did as well), and it hit me hard. I’m not sure why. It’s not my usual type of poetry. But I really like it a lot.